As featured on Gardeners’ Question Time …. I was recently interviewed on the Radio 4 programme, Gardeners’ Question Time, about our commitment to greening front gardens – whether or not they are needed for parking cars, they can still be verdant, wildlife-friendly, lovely spaces. I mention a few tips and ideas for simple tweaks to a garden, you don’t have to rip up all the block paving and start from scratch – great if you can, but not always possible, I know. Catch it on a BBC podcast or you can click here – I’m interviewed about 15 minutes in (though of course recommend you hear the whole programme, lots of general helpful information from the regular GQT panel!). 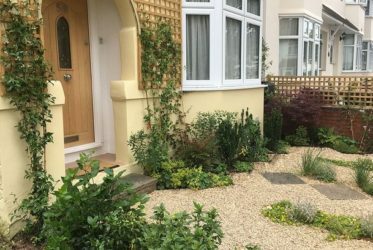 We’ve written about front gardens before (a constant problem particularly in our cities where so many people want to park cars off road) – previous blog post here.